Are Wired or Wireless Home Security Systems Better? If you're in the market for a new home security system, you are likely faced with the decision to go hardwired or wireless. Both options have their merits, but it really comes down to the needs of the user. But we will say that in most cases, a homeowner will want to go the wireless route. That's not to say that hardwired home security systems aren't right in certain situations. It's just that they offer greater challenges than wireless systems. Most users will want the convenience and ease-of-use that hardwired systems simply cannot offer. Perhaps the most obvious factor is that wireless systems are much easier to install and get started with than hardwired systems. This can be very important for DIY users who don't want to hire a professional installer. Many wireless alarm systems can be installed without even drilling any holes. Although they can certainly be mounted, most wireless systems support desk stands that allow them to be conveniently rested on any desk or table. Wireless systems can also be readily used with wireless sensors. These sensors can often be mounted using double-sided foam tape, thereby eliminating the need to drill holes. On the other hand, a hardwired system will almost certainly need to be mounted. These systems provide ready support for hardwired sensors. Any hardwired sensor will need to have a wire that is connected directly with the system. This can mean running wires across the entire premises for a complete hardwired setup. Although most wired systems can be configured to use wireless sensors, they will usually require a separately purchased wireless receiver to make this possible. The next consideration that a user should make is the ease of use for the system. Most users find that wireless panels are much easier to use and program. These systems often feature built-in touchscreen controls and menus that are easy to navigate. With some minor instructions, an end user will be able to set up their wireless system in its entirety. Additionally, the touchscreen navigation will make it easier for the user to perform basic system functions like arming and disarming. This can be very important for users who aren't always the most tech-savvy. Hardwired systems function differently. These panels typically use external hardwired keypads that are wired-in directly to the panel. Although there are some wired touchscreen keypads, most wired keypads are of the push-button variety. This means that a user will have to enter-in various codes to perform basic system functions. The menus will not be as easy to navigate, and deep-level programming will often require the use of an intricate and sophisticated programming guide. In fact, many users of hardwired systems do not even attempt programming, and they leave the task to a professional installer. Another advantage that wireless systems offer is that they usually come more "ready" than hardwired systems. That is, wireless systems typically require fewer add-ons than hardwired systems. Many wireless systems come ready-to-go right out of the box. As mentioned earlier, these systems come with integrated touchscreen controls so that no external keypad is needed. Wireless panels also come with built-in wireless receivers so that they can support wireless sensors. If a user wants to use wireless sensors with a hardwired system, they will almost certainly need to add a wireless receiver. Modern wireless panels will also usually come with some type of communicator so that they can readily connect with a central monitoring station. But please note that many wireless systems will still need to have a cellular communicator added for cellular monitoring services. Hardwired systems don't come nearly as ready. Virtually every system function for a hardwired panel will require some type of add-on. Even basic functionality will require an external keypad. And hardwired systems almost never come with a built-in communicator. Instead, a separate communicator will need to be added and installed if a user wants reliable connectivity with a central station or an interactive service platform like Total Connect 2.0 or Alarm.com. One area where wired systems do reign supreme is adding value to the property. A hardwired system with wired sensors will essentially integrate in with the building itself. This is something you can actually list when selling the building, and it can certainly increase the property's resell value. But a wireless system is not necessarily considered a fixture in the home, and it will not add to the home's value. However, the upside is that wireless systems can be taken to a new property much more easily than wired systems. The user will just need to unplug the panel, dismount their sensors, put them in a box, and bring them to their new house. But for hardwired systems that have wires running throughout the building, the process is much more challenging. Many wires and sensors may be inaccessible, and a professional might need to remove them. For that reason, it's not much of a surprise that a user will often leave their hardwired system behind when moving to a new property. As mentioned earlier, this can provide the added benefit of increasing the home's resell value. One final consideration is that wired systems usually require less maintenance than wireless systems. Wired sensors use power provided from the panel, and they will almost never require any type of maintenance. In other words, once a hardwired system has been installed and programmed, a user will almost never need to make any adjustments. The only thing they will need to worry about is replacing the panel's backup battery every few years. But the wireless sensors that are used with wireless systems cannot receive power directly from the panel. Instead, these sensors rely on internal batteries that must be replaced every few years. If a user has many wireless sensors, they can expect that they will need to replace many sensor batteries at some point in the years to come. Fortunately, the wireless panel will let the user know when the sensor batteries are low and in need of replacing. It's also important to remember that most wireless sensors offer fairly impressive battery lifespans, and batteries will not need to be replaced very often. But this is still more maintenance than what is required with wired systems. In conclusion, most users find that wireless alarm systems are the superior option for home security. They are easier to set up and use, require fewer add-ons and are easier to bring to a new location. But a user might prefer a wired system in situations where they want to add to the property's value or if they want a system that requires as little maintenance as possible. If you still can't decide between a wired or wireless system, feel free to reach out to us for help! You may email us at any time at support@alarmgrid.com. Or if you prefer to call us, you can reach us at 888-818-7728 from 9am to 8pm Monday thru Friday. We look forward to hearing from you! Honeywell Lyric Controller Finally Homekit Compatible! I'm sure many people were disappointed to see the Lyric MR4 firmware get released last month and have the firmware update NOT include the Lyric / Apple Homekit integration that has been promised since the Lyric first debuted at ISC West back in 2015. We've been as frustrated as our users and potential customers have been that have been waiting anxiously for the Homekit integration to the Lyric system, and since Honeywell was at the mercy of Apple releasing the approval for the functionality to be made available, even Honeywell wasn't sure exactly when it was coming. With all that said, we're excited to announce that as of this week, a Lyric running MR4 firmware can now integrate with Apple's Homekit! We just found out about the release and we haven't been provided with all the details on the functionality the integration allows but once we get more information from Honeywell and do some testing ourselves, we'll be posting more about this awesome update to the Lyric system! In the mean time, if you want to confirm your Lyric can do Homekit, just press Security > Tools > enter Master Code > Advanced and if you're on MR4, you should see a Homekit Reset button that wasn't there previously. If you aren't seeing that button, you should check the System Information tab to see if you're on the MR4 firmware (01.04.07178.491) and if you aren't you can either ask your alarm monitoring company to remote upgrade you or if you have the right firmware version to allow a local firmware update request, you can go to Security > Tools > enter Installer Code to see an option for 'Update firmware' which will get you up to the latest version. You can request the update on your Lyric system, if you aren't upgraded already, by pressing Security > Tools > entering your Installer Code and then pressing Update Firmware. If you are an Alarm Grid monitored customer, you can also have us send a firmware update to your system remotely. This MR4 firmware brings new functionality that our users have been asking for since the Lyric Controller was first released, new features that were not yet available and fixes to some known bugs. While this new feature won't help those that already have their Lyric system fully setup, the addition of a new SiX sensor enrollment mode allows new Lyric users to greatly reduce the time it takes to program SiX Series sensors to the system. Of course, the new SiX Programming option would certainly also be helpful for anyone that has an existing Lyric and is looking to add multiple new SiX devices to their system. The Lyric has always offered a batch enrollment mode, available within the Zones programming screen, that allows you to learn in a group of SiX devices by simply powering on or activating each sensor. However, you would then need to go in and manually edit each zone by selecting the zone number and clicking Edit, tweaking each programming option and then saving the changes as you would if you were learning in one single sensor. and you can highlight and click Edit right from that screen to bring up a new screen that shows you all of the device settings so you can set all of your new zones and settings much more efficiently. The new SiX Programming mode can save you hours depending on how many SiX devices you need to learn to your Lyric. Keep in mind though, just like with the batch enrollment mode, you can't enroll a SiXFOB to your Lyric using SiX Programming. You still need to use the Keys section of the Lyric programming to enroll a SiXFOB. 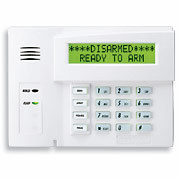 For as long as we can remember, Honeywell systems have supported an Instant arming mode which allows a user to arm the system so that the system's alarm activates as soon as a zone is triggered, even if the zone is normally an entry/exit zone. Instant arming is helpful for ramping up the security of your system when you know that no one should be entering the home (at night or when you go on vacation for instance). Instead of an intruder being able to open your main front door without the alarm going off right away, Instant arming ensures that the Lyric goes into full alarm mode as soon as any door or window is opened. As long as you remember to disarm from a key fob or TC2 before an authorized user needs to enter the property, Instant arming is a great way to enhance your protection at key times. When Honeywell developed the Lyric they didn't provide an Instant button on the Security screen and many users lamented the loss of Instant arming. The Lyric does in fact allow for Instant arming if you use the Arm Custom option which gets you to a screen where you can de-select the Entry Delay and arm the system so that delayed zones activate the alarm as soon as they are violated but it isn't a great user experience. We had a good amount of feedback from users that had upgraded Honeywell systems that supported Instant arming to the Lyric and were disappointed that arming in that way was more difficult on the Lyric. Thankfully, Honeywell has heard our cries and with the MR4 firmware, you'll notice when you hit the Security icon on your Lyric screen there is an Entry Delay: On/Off toggle at the bottom left of the screen. If you want to arm Instant (motion detector zones turned off but all other zones active with no entry delay even if programmed as an entry/exit zone), simply tap the Entry Delay words until it shows OFF and then tap Arm Stay and enter your code. If you want to arm Maximum (all zones active with no entry delay even if programmed as an entry/exit zone), simply tap Arm Away with the Entry Delay set to OFF and then tap Arm Away and enter your code. You may have noticed if you press Tools and enter your Master Code and then the right arrow, there's a Skybell Setup button. If you did, you probably have wondered why pressing it does nothing. For some reason Honeywell released the Skybell Setup button on a previous Lyric firmware but didn't add the true functionality of the button until the new MR4 firmware. You could still pair a Skybell with a Total Connect 2.0 account but the Skybell wouldn't integrate with the actual Lyric system at all. Now, pressing the Skybell Setup button allows you to integrate your doorbell camera (the round Skybell HD and Skybell Slim HD) to the Lyric Controller so that if someone presses your Skybell's doorbell, the Lyric sounds one of it's unique Chime tones. You can choose which Chime sound you want during the Skybell Setup process. With MR4 firmware, the Lyric can now trigger a maintenance trouble signal if a connected SiXSMOKE detects that it's sensing chamber has too much dust or dirt for the detector to function properly. Similar to programming a loop 2 maintenance trouble zone for a 5808W3 smoke detector, you'll now know in advance if any of your connected Honeywell smoke detectors need cleaning. The Lyric's Automation controller provides support of Z-Wave locks so that you can program the system to auto-arm when you lock your door or auto-disarm your system when you unlock your door. If you have Total Connect 2.0 you can even remotely lock/unlock your doors. We recommend Yale, Kwikset and Schlage locks when connecting Z-Wave locks to your Lyric and with the MR4, the Lyric now officially supports Yale's range of Real Living Assure Locks, the YRD216, YRD226 and the key-free YRD246. We'll have these new Yale Z-Wave locks up on our site in the Home Automation section soon. Sometime prior to MR4, we found that if you had an LKP500 Lyric keypad connected to your Lyric system and you had the Lyric's Voice setting disabled, the Lyric keypad would not provide the expected entry tones (beeps when you violate an entry/exit zone warning you that you need to disarm the system to avoid an alarm activation) even if the Entry Tone feature was enabled in the keypad settings. Once your Lyric is on the MR4 firmware, if you like your system's Voice setting disabled, because you don't want to hear the main panel's voice announcements, you'll still be able to have your auxiliary keypads beep at you to warn you that you must disarm your system when coming home. As it's easy to forget your system was armed if your keypad doesn't beep at you, this is a critical fix for any Lyric user that prefers not to have the Voice setting enabled. We had a customer that noticed that once he connected his Lyric thermostat to his Lyric system, the Lyric was excessively pinging out to the Honeywell servers. We reported the strange IP behavior to Honeywell's engineers and after some testing they were able to replicate the issue and assured us that a fix would be coming. Our customer decided to remove the Lyric thermostat integration from his system for the time being. Once MR4 was released, we had our user test the Lyric thermostat integration to his Lyric system and this time there was no unusual pings from the panel on his network so we are confident that this Lyric bug has been squashed. In addition to the slide show page, the dealer branding also shows up as a small company logo on the bottom left of the Lyric home screen that you can click to get to a contact information page in case you need to get in touch with us for support. 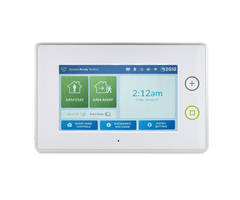 If you have any questions about this feature of any of the new features and updates and fixes that the latest Lyric firmware brings to Honeywell's aware winning system, please let us know in the comments below or email us at support@alarmgrid.com. Alarm Grid has been beta testing the Lyric Controller for about 6 months now, letting users install it on their own using their DIY resources. Needless to say, there are a number of features that make this panel different than any other security system ever developed. Most notably, perhaps, is the way the wireless sensors, themselves, communicate to the main board. While previous systems had been developed allowing one-way communication between the mounted sensors and the panel, Lyric’s SiX sensor technology, allows for two-way, fully encrypted communication between the panel and the sensors. This means that sensors themselves can receive firmware updates and that the communication between the Lyric and its sensors is uninterruptible. Moreover, for those that have invested in the older 5800 Honeywell technology which was standard with all wireless systems before the Lyric, the sensors are backwards compatible. Alarm Grid provides resources on YouTube, and encourages anyone with questions to email them at support@alarmgrid.com. The L5100 is the security system that changed the industry forever. Honeywell gave things a try with its predecessor, the L5000, but it just wasn't right. While the L5000 may not have hit on all cylinders, the L5100 was a smashing success. A Z-Wave controller, a security system, and a beautiful, simple to use user interface ushered in a new era of home security. Responsive, colorful, and simple to use, the L5100 made home security accessible to the common man. The result of the simple 3-touch auto-enrolling process for zone programming, or simple typing in of a serial number, made it so there were no longer complicated button presses to get in and out of programming. Moreover, this wireless panel was the first full-scale wireless panel that truly won over the old-timers who resisted the transition from wired to wireless. The modular approach to adding communicators gave consumers choices about what exactly they want their system to do. As of today, stock across the country has been exhausted of this groundbreaking panel, and we have discontinued its sale in our store. It has been replaced by Honeywell's newer, bigger, better panels the L5200 and the L7000. These two new panels are wonderful replacements for this workhorse, and we're sure they are going to become the industry standard for years to come. While different in some ways, the L5200 and L7000 are wonderful additions to the Honeywell family and welcome replacements for what was once a revolutionary panel.